May I use the Syleveon sprite to fuse with a Poochyena sprite please? It's for my own use on this site only. (Will be uploaded to PFQ image uploader). 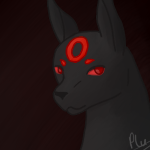 Avatar of my PokeSona Shadow the Umpardious9 Art by Plu "These dark days begin to fade, only to bring another dark age". "This world is full of darkness and one person can't really change that. However, you could be the light to anothers world".